eBook HTML, PDF, ePub, Mobi (Kindle), etc. 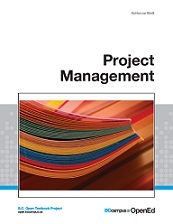 The primary purpose of this text is to provide an open source textbook that covers most project management courses. The material in the textbook was obtained from a variety of sources. All the sources are found in the reference section at the end of each chapter.